A while back, I wrote about how Nintendo is coming up with a new Pokemon game for the Switch. In addition to this awesome news, they also announce a new peripheral device that will be coming out November 16, 2018. This new device promises a lot of extra perks to enjoy while playing Pokemon: Let’s Go! So, what is the Poke Ball Plus? To put it bluntly, it’s the exact same as the Pokemon GO Plus, only that it is an actual ball! 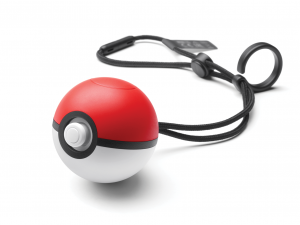 Instead of wearing a wrist strap with a big red and white Bluetooth button, you can now carry around a Poké Ball! It is roughly the size of a golf ball. There are two other things that set it aside from it predecessor; it has a rechargeable battery, and it can be used not only in Pokemon GO, but in the upcoming games for the Switch. How does it work on the Switch? Fairly simple, actually. It is essentially a Joy-Con in its own right. The ball has motion activated controls, as well as lights and sounds, and it vibrates. You can use it to move your character around the game, navigate through menus, and of course, to catch Pokemon. You can pretty much use the Poké Ball Plus in place of your controller! The “button” on the front is actually a joystick, and is used to move around in the game, as well as navigate through the menu. When a Pokemon appears, you can try to catch one by pressing the button, and moving your Poké Ball Plus just as if you’re throwing it. Just as with the Joy-Cons, the ball will come with those safety straps so that you don’t accidentally throw the ball through your TV. The Poke Ball Plus will even shake and light up when a Pokemon is caught, just like in the game. Giving it a little shake will cause a Pokemon to make its iconic cry inside the ball. I really like the idea of bringing along a Pokemon wherever you go; it’s a nice immersive way of bringing the Pokemon experience to life. This feature was mentioned by a representative for the Pokemon Company. This feature reminds me of Pokemon GO’s Buddy feature, where you can walk around with your Pokemon to get candy for powering up and evolving. As for these in game rewards, that remains to be seen. How does it work on Pokemon GO? The Poké Ball Plus works pretty much the same as the Pokemon GO Plus. You’ll have to connect it to your mobile app, and once done, you’re good to go! When a Pokémon appears nearby, the Poké Ball Plus will light up and vibrate, just like the GO Plus. A simple button press lets you throw a virtual Poké Ball, and different LED light patterns will let you know if you’ve caught the Pokémon. I would assume that it only uses Poke Balls, just as was done in the original device. As long as your Poké Ball Plus is connected to your smartphone and the Pokémon GO app, it will also count your steps so you can hatch Eggs and get Candy for your Buddy Pokémon. One thing to take note of: The Poke Ball Plus only has a 3 hour battery life, where the Pokemon GO Plus lasts for much longer. At the same time, the Poke Ball can be recharged, so you won’t be completely out of luck. All in all, this looks to be a very promising accessory to your gaming sessions, either on the Switch or on Niantic’s mobile game. If you play on both, you’ll definitely be getting the most bang for your buck! The device is coming out November 16, 2018, the same date as the Pokemon: Let’s Go! games. I hope you enjoyed the article. If you have any news to share, or if you’d like to leave some feedback, feel free to do so!